After two and half years, this is my last week at Torchbox. An announcement tinged with both sadness and excitement. Sadness because during my time here I’ve had the opportunity to work with an incredibly smart and committed team of people, on very cool projects for organisations as diverse as Greenpeace UK, The Joseph Rowntree Foundation, and Coeliac UK. Excitement because of what the future holds. I’m very proud to announce that from the 7th of March I will be joining the Whale and Dolphin Conservation Society as their Head of Online, or as I’m personally going to refer to it, “Chief Geek”. Grandiose title aside, I’m going to be delving into everything they do online. Their public web presence, educational outreach, social media involvement, research tools, and a whole lot of other things I’m forgetting right now. In short, I have been tasked with turning the WDCS into the exemplar 21st century, web-native, conservation organisation. It’s going to be one hell of a challenge, but I cannot wait to get stuck in. 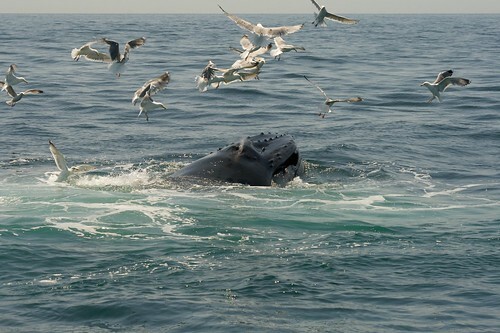 That would be whale watching off the coast of Massachusetts, not floating around getting harassed by seagulls.